Over the past few years I've won several job-lots on eBay that included damaged or outright broken items, but which with a bit of TLC could still be useful. 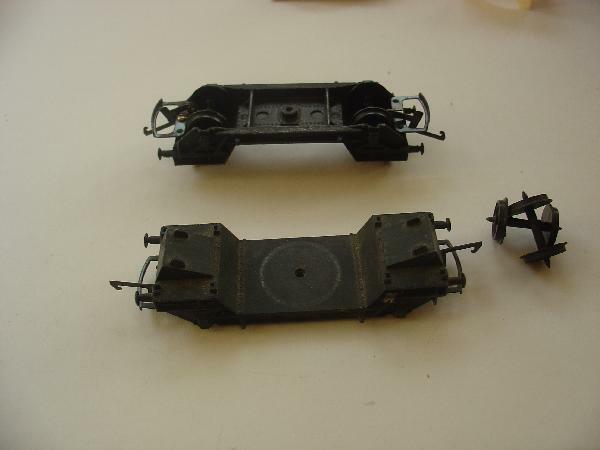 Two of these items were Hornby 4-wheeled crane underframes, both without wheels and with the wheel mountings damaged. I've now located some suitable wheels (for Ratio coaches) and have a cunning plan for these for later. Meanwhile, one had a crane mechanism with the centre of the jib missing. This has now been filled with some new U-girder sides and cross-bracing from the side of an RAF aeroplane recovery trailer (a 10p bargain found at a club's 2nd hand stand). Also in the spares box was this base-plate that could be the swivelling base for the crane, and - if I decide to model it as a steam crane - a useful bit of old lorry that can be clad in corrugated plastic and used as the cab. While I'm no longer building a layout, these construction jobs can be visited from time to time and will finally use up some of the bits that have been lurking, some for years, in a crowded scraps box. The crane base has been trimmed and looks good. Work has paused while I look for some wheels to add to the ends of the winding pegs. When it's finished I'll see if it can go on the wharf on Shellsea Harbour. Meanwhile, I've been getting on with the conversion for the crane's running chassis. It's being up-scaled to Gn15. Looks as if I'll have some more raw material available for this thread. I was selling these wagons today, but nobody bid. 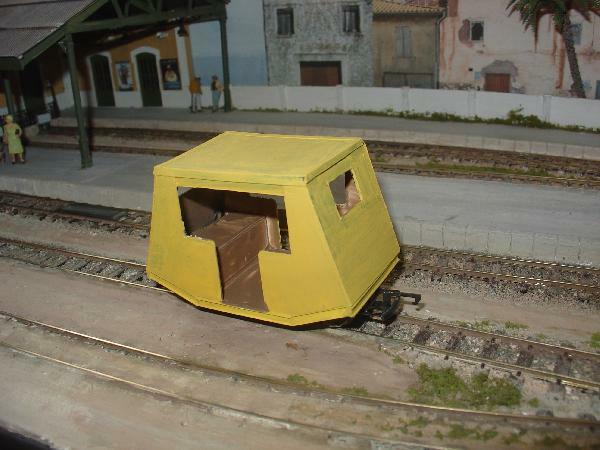 I have in mind a couple of O-16.5 narrow gauge tourist coaches for the opens and an enclosed van (brake van, maybe?) for the van, although it might just do for a conversion for Salop Street. No ideas yet for the tanker. Also got some Jouef HO BR goods brakes to convert or sell. It doesn't take much to convert one of those open wagons into a tourist coach (providing your tourists are weatherproof). Thanks for the reminder of the FCPyF's torist coaches, Bob. I think my open wagon with cupboard doors will be converted as yours, while the "British tube wagon" with drop doors may end up longer, with end platform entrance(s). I have some suitable tourists ready and waiting, once the wagons are complete. No idea of a design for the van - probably just build a box around the original body, as this is slightly damaged (and a fairly crude moulding, anyway). I got the wagons because of their odd springs, which I thought looked quirky enough to use on 1860, but already have more wagons than needed for that layout. You could also box the tanks in, though just adding rocket stick solebars to make the wagons wider, then new ladders and access hatches as required, works for On30 tank conversions. Think I've got a bit of rocket stick somewhere, Bob, but pickings have been slim the last couple of years. Not sure at present which underframe to use with which conversion - as usual I'm planning some body/chassis swaps, as the brake underframes already have the start of a step-board for the tourist coaches. I'm also in half a mind to make the crane a rail-mounted one, so a couple of flat (ex-open) underframes would be useful - or I could use the tanker's one. Always a bit in two minds about cylindrical tanks on narrow gauge lines; I know they did exists (on the Donegal, to fuel the fishing fleet at Killybegs, I think) but it can look a bit contrived, which is why it took so long to get the 4-wheel molasses tanker for Puerto Paseo to look believable. 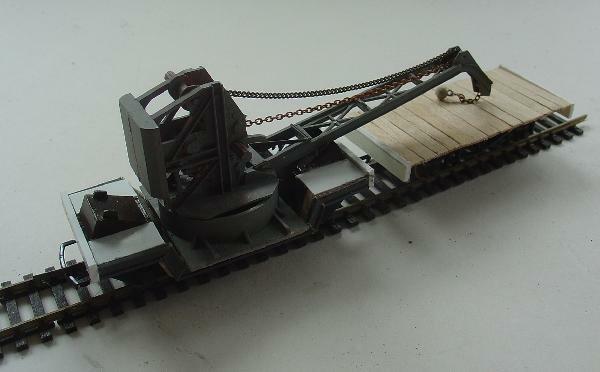 Meanwhile the first of the conversions of the crane underframe is well under way, as a quarry man-rider in Gn15 scale. Come to think of it, why don't I just mount the crane back on its own chassis - now I've sorted out how to refit the wheels into journal boxes that had been routed out, and so made fairly useless. Seems like a good plan! The crane was tried out on the quayside at Shellsea. Looked good but a little too large - the winding mechanism area is heavy industrial in feeling, and if I boxed it in to make it into a steam crane, it would look even more massive. 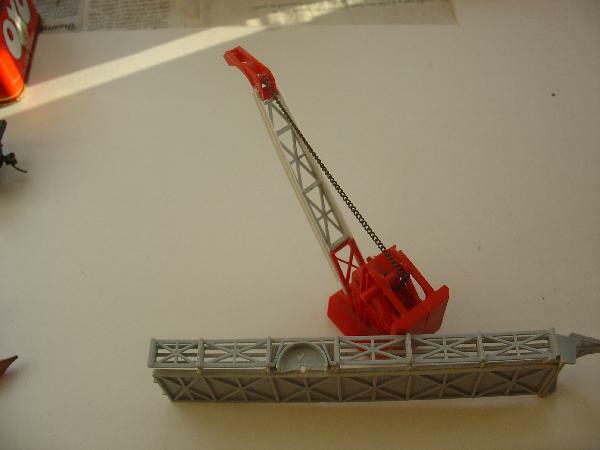 Instead I have started work to make it into a medium-sized travelling crane for 7mm/On30. 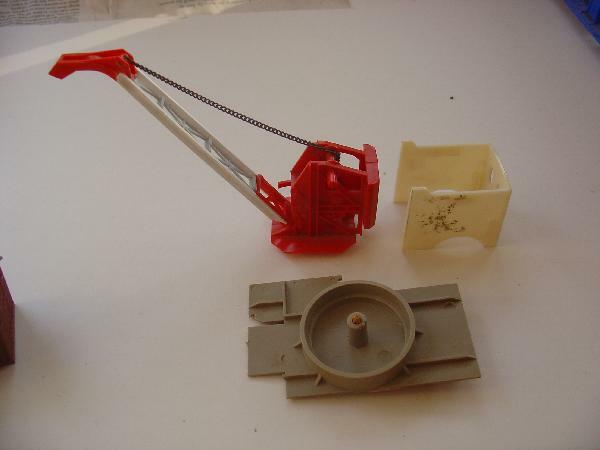 There is a spare Hornby chassis for the crane's runner/tool wagon, or one of the Jouef underframes could be used. There is also a Tyco caboose chassis that has already been widened, so that looks like another On30 boxcar or perhaps a gondola. The plastic chassis has bowed with the glue used to add the wider platform, so the body may have to reflect this. To its advantage, it has Kadees already fitted. 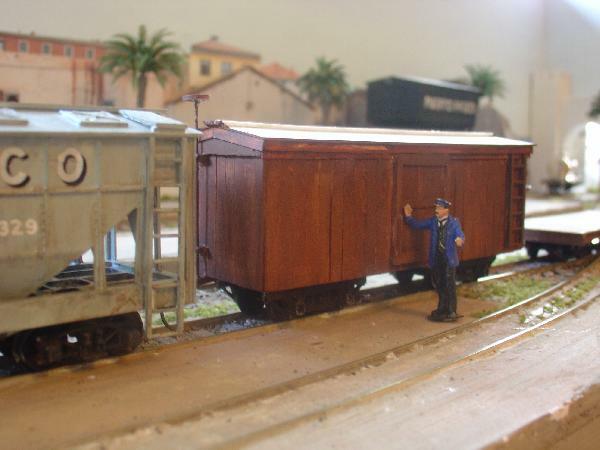 There are also three Jouef HO BR brake vans, needing useful employment. A little progress on the On30 travelling crane, which now has a runner wagon courtesy of a Jouef underframe, some scale wheels and, inevitably, some coffee stirrers. I seem to remember from somewhere that the crane is a fairly accurate model of a GWR hand operated crane of around 3 to 6 tons capacity. The reason for its massive appearance is the arrangement of the counterweight. This meant it could work in more restricted spaces near walls or other tracks. Many thanks for that information, Clive. Now you've said that, it makes perfect sense of the shape of the counterweight at the back of the crane. Still, it's a bit late to remain as a GWR product - I've widened the wagon base to match the width of the pivot found in the spares box, so it's definitely become a freelance narrow gauge travelling crane - perhaps used at stations without a fixed unloading facility. I also have a model vertical boiler of about the right size, and it's crossed my mind that this might be added to make a steam crane. Quite a bit of research needed though, before going down that route. 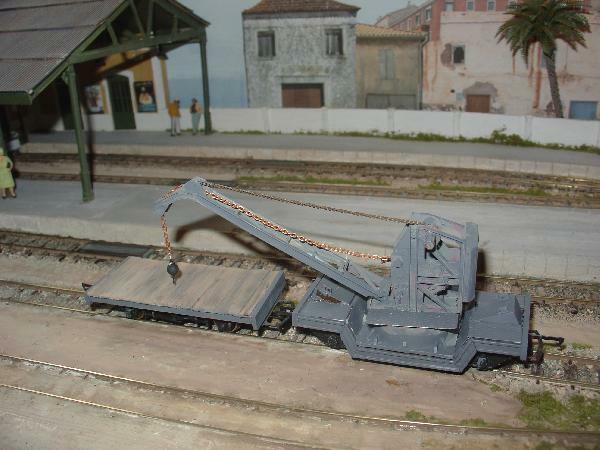 The crane and its runner are now finished, although the photos showed a small paint touch-up is needed. It has scaled up to On30 quite well. The other project, to use up another crane underframe, is this miners' riding car for Gn15. It needs weathering and perhaps some warning chevrons before it starts to look well-used. The ends and roof were used as a test-bed for card modelling reinforced by undercoating the pieces with emulsion paint. Seems to work OK, so I must use it again when I can. I really like that manrider. Not just for mining use, done in more sombre colours it'd make a neat little coach for an estate railway. Elsewhere on this site it has been suggested that I might build a vacuum cleaner van, and a picture of one once owned by the LT&SR was included. It certainly looks like a good alternative idea for a spare crane chassis, as the body follows the "low-loader" dropped centre look, only needing a little more length to be added beyond the wheels at each end. The metal body looks a simple enough job in styrene, although the vented panels would need a bit of thought. The original is now at Mangapps Farm in Essex, and a few details about it appear on their website. Visited the South Herts MRC show at Bushey, today. Left home in a hurry without the camera, which was a pity as there were several nice layouts. It was a useful day on many levels - chatted with mates, and had the fault on my On30 Mogul diagnosed and on returning home have managed to improve matters there. The loco now runs again, but does sound as if there's a problem with the motion (which indeed there was/is); a bit of running in may help, or a bit of fettling. 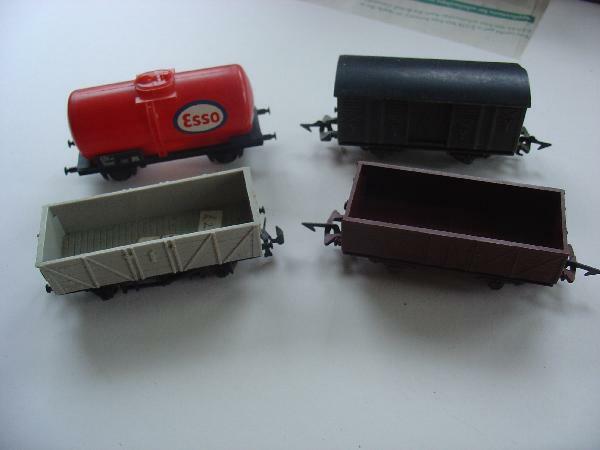 The show always seems to have a number of used-trains dealers and I picked up wagons for three of my projects, including a short carriage truck for Salop Street, plus two 3-plank opens and a gunpowder van for the Cornish project. Rather more in fantasy land I also found some cheap US freight cars to start assessment conversions for 3ft gauge in 1/55 scale. I will use an old Tyco caboose chassis, with the end balconies cut off for another freight car. It was going to be used on Puerto Paseo for a CyO caboose, but these are now Bobbers, so the bogie chassis was going spare. Busy times ahead, it seems.